The Climate Scoreboard shows the progress that the national plans submitted to the UN climate negotiations will make in mitigating climate change. Our analysis shows that the national contributions to date, with no further progress post-pledge period, result in expected warming in 2100 of 3.3°C (with a range of uncertainty of 1.9 – 4.4°C). This analysis includes the Intended Nationally Determined Contributions (INDCs), Nationally Determined Contributions (NDCs), and long-term strategies. Intended Nationally Determined Contributions (INDCs) – Plans submitted to the UNFCCC before the country or member state ratified the Paris Climate Agreement. Nationally Determined Contributions (NDCs) – Plans submitted to the UNFCCC once the country or member state has ratified the Paris Agreement. In most cases when members ratified the Paris Agreement their INDCs became NDCs. Currently NDCs typically end in 2025 or 2030, however countries will be asked for additional NDCs in the coming years. Long-term Strategies (also called Mid-Century Strategies) – Proposals that communicate the decarbonization pathway a country aspires to follow out to 2050. National Plans – 3.3°C (6.0°F) – No change after national contribution pledge period. 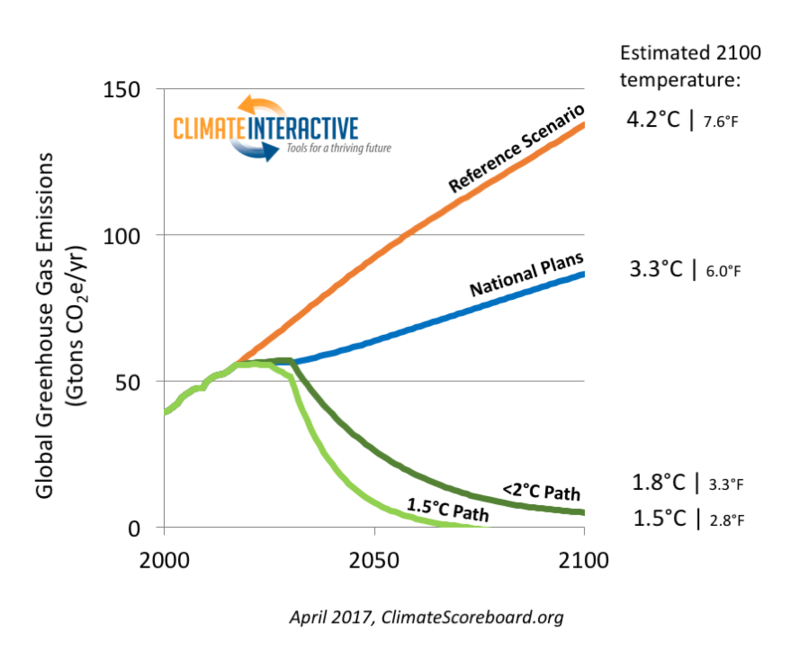 The image below shows potential emissions pathways and their long-term impacts in temperature. Explore the data and analysis. With action to reduce fossil fuel emissions and greenhouse gas emissions from other sources, the world can still realize the pathway that keeps warming well below 2.0°C this century. How Could the Climate Talks Ratchet Up to Success? This video highlights the pledges that countries made for the Paris Climate talks and shows a path countries could follow to limit warming to 2°C. Share the Scoreboard. You can follow, talk about, and publicize the progress of the global negotiations. Engage others in a powerful simulation game. Join others who are bringing the international climate negotiations to schools, organizations, or groups in their communities by running our World Climate simulation game. Exercise your power as a citizen. Based on what the Climate Scoreboard is reporting, you can thank those governments that have made responsible pledges, and you can demand more from those governments who need to do more. Receive notices about future updates. 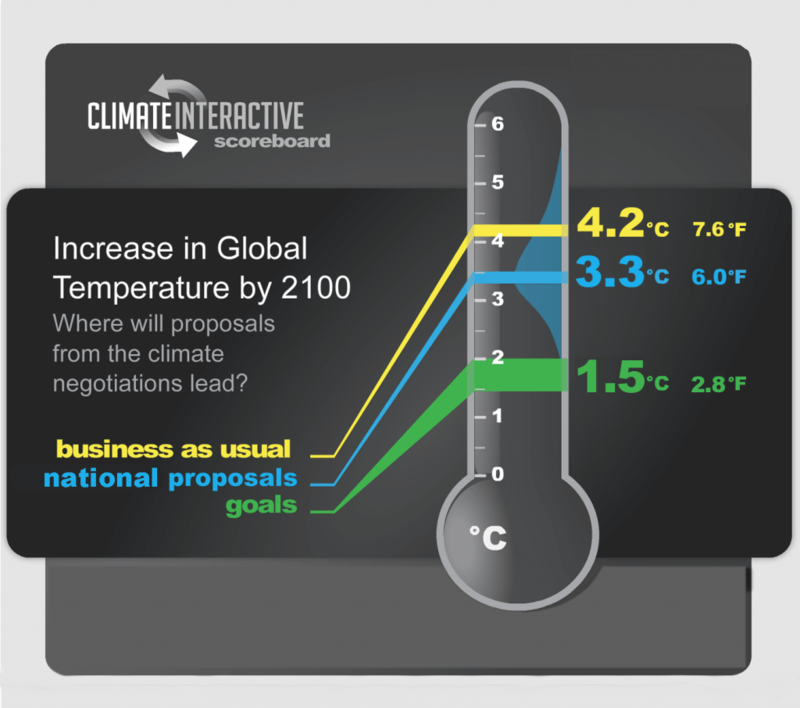 The Climate Scoreboard has been publicized in over 4,000 local and international news outlets. Click here to view a sample of the media coverage.